Really fantastic first day of competition at Hoylake leaving a leaderboard stacked at the top with the best in the world (Rory, Sergio, Adam Scott, Tiger). Haven’t seen much in terms of stats anywhere, though the course played to around 73.5 (+1.5 to par). Almost all of the very best scores came from the early wave with only three players breaking 70 in the latter half and fifteen breaking 70 in the morning half. I’ve adjusted the scores for ability (using my ratings) and tee-time in an attempt to measure how everyone would’ve played if they had theoretically teed off at the same time. Rory still comes out looking best, but Adam Scott and Shane Lowry both look much better relative to the rest of the top 10. 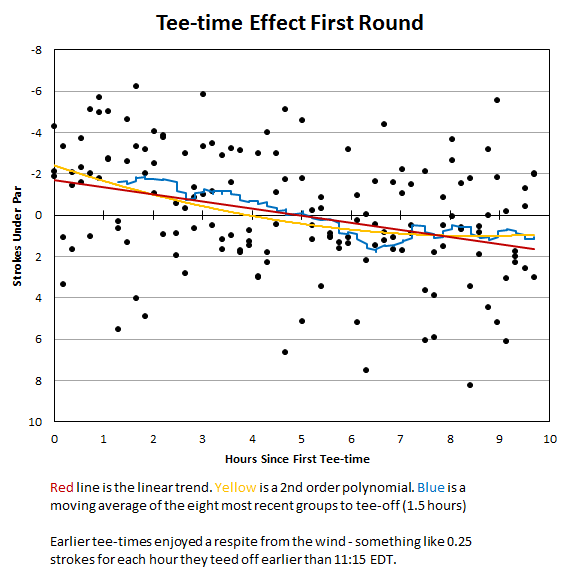 The chart is linked below and shows that for every hour a golfer teed off earlier than 11:15 EDT the course was 0.25 strokes easier and later than 11:15 EDT 0.25 strokes harder. That ~2.5 strokes difference is largely in line with more mild past British Open rounds (more extreme past rounds got up to 6-8 strokes between early and late tee times. The real question is what the weather will be like tomorrow, especially whether it will change. The R&A’s insistence on sending everyone off the first tee means weather exacerbates tee-time based differences in course difficulty. Typically courses play easier in the morning because they’re softer and the greens haven’t been walked over as much. They get harder in the afternoon as the greens firms up and get walked over by a couple hundred people. The Open adds the variable of wind to the equation. If early conditions tomorrow are windy, it could cost the late Thursday/early Friday group a couple of strokes relative to the early Thursday/late Friday group – definitely enough to cost Adam Scott and others a run at the Claret Jug. The forecast tomorrow calls for the wind the be strongest around the early morning tee times (~17 mph) while weakening into the afternoon (~11 mph). That’s in line with what occurred today however, meaning it doesn’t look like conditions will differ much between the earlier and later groups. Your live-scoring destination for the weekend is Ken Pomeroy’s awesome automated Twitter feed @KenPomGolf. EDIT: Now that I have seen basic field stats (61% GIR, 63% Fairways, 281 yards off the tee) I can say there’s nothing that interesting going on here stat-wise. Scrambling came in at only 50%, which is low compared to PGA Tour average.